What's the most complex model you've ever made? It has 1280 external face parts, with nets being printed by Stella onto 42 A4 pages. The model has a diameter of just over 30cm. However the most frustrating model might be this faceting of the snub dodecahedron. Although it only had 372 face parts, it turned out to be very messy to construct. I had to scrap my first attempt, after realising it wasn't going to work, and then couldn't face it again for some time. Eventually I came back to it, started again, and managed to finish it. Last edited by robertw on Mon Feb 11, 2008 12:25 pm, edited 1 time in total. 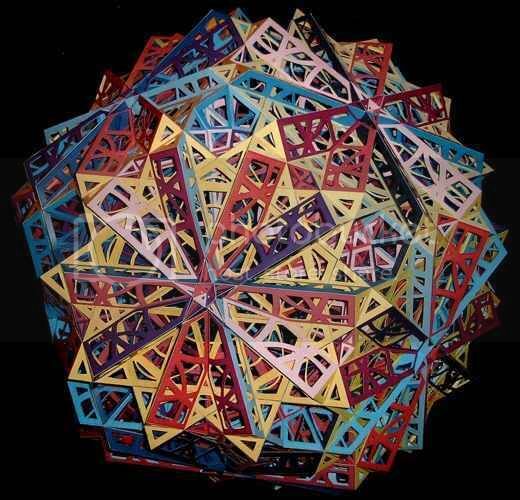 For me the model with the most amount of faces would be a fractal kinda octahedron. It counts 1728 faces and funnily enough it belongs to the smallest models I built. 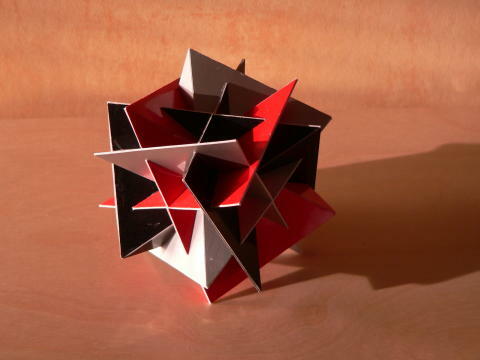 However building polyhedron models is a bit like climbing, where the highest climb might not necessarily mean a climb for which most skills are needed. The model above requires patience, but the construction is not very difficult. actually required more skills. 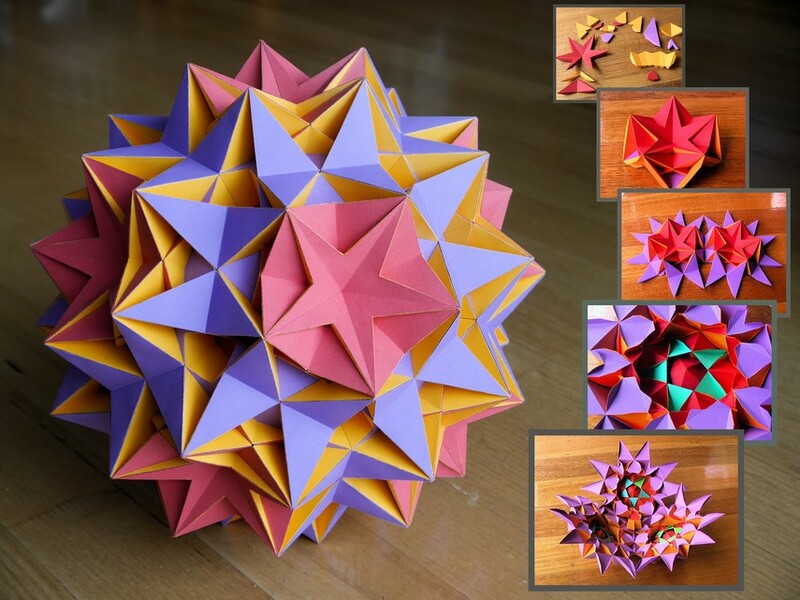 It is a stellation of a trapezoidal icositetrahedron. I think that chiral models are in general more difficult to build. For this particular model I had the feeling that the templates should be adjusted for the thickness of the material as well. I was not very satisfied with result (the edges aren't very straight) but I didn't really feel like starting over. Last edited by marcelteun on Tue Feb 12, 2008 7:33 am, edited 3 times in total. Sorry, but I can't figure out how to place an image on this post. pentachoron wrote: Sorry, but I can't figure out how to place an image on this post. And use the preview to make sure it's working (but don't forget to submit as well after that!). 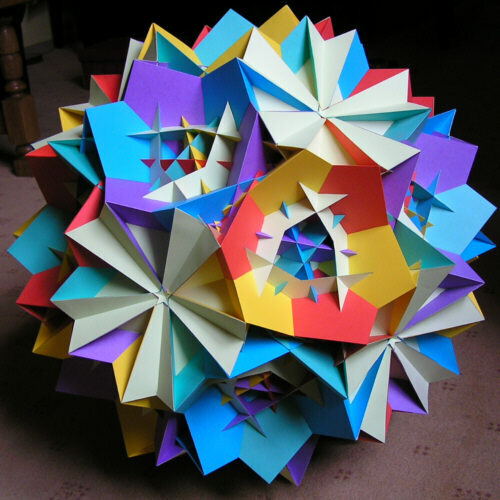 piotr wrote: The most complex model I made is the uniform compound of 5 great rhombicubeoctahedra (W85). Yeah, it looks great (already makes an appearance on my Stella Users' Models page along with some of your other constructions). I half completed that snub with 4 triangles and a pentagram at each vertex (shaped like a narrow pentagram). Had to give up after complaints about the language from next door neighbour. For all the complexity of such snub solids, my favourite polyhedra remain the Great Icosahedron and the Great Dodecahedron. Had to give up after complaints about the language from next door neighbour. The most complex model I made is the uniform compound of 5 great rhombicubeoctahedra (W85). Piotr, you're a true master! Re: What's the most complex model you've ever made? With my own hands it was a Miller's monster about a foot across, which I enameled in seven colors. I couldn't carry it across the continent when I moved from Toronto to San Diego, so I left it (and a few other models) with Coxeter. It was the first time he had ever seen one in the flesh. "So this is Miller's monster!" he exclaimed when I brought it to his office. Just then his phone rang, and he answered the phone with, "Hello! Something really exciting has happened. One of my students has brought in a model of Miller's monster! Can you believe it?" Hugo Verheyen told me in the early 1980s that he had seen the model at Coxeter's home. I also worked out the complete faces of a yog-sothoth using a CalComp plotter in a couple of days' work, but I ran out of time before I could actually build it. So Bruce Chilton built the actual model, about three feet across, and we displayed it at "Shaping Space" in 1984 at Smith College. There's a photo of our model by George Hart elsewhere on this forum. As far as I know, it was the first model of that figure that had all the correct facelets; the model in Magnus's book is (frustratingly) not quite accurate, nor was any other model of it built from the plans he used. Oxenholme (at this forum) later used my plots to build a model for himself. Now Stella4D will print out the correct nets without batting an eye. Maybe after I retire later this year and clear out a work space for myself, I'll get back into some model making. I'd like to put together sets of all the nonprismatic uniform polyhedra and uniform compounds someday. Thanks Rob for your help, here is the image. marcelteun wrote: For me the model with the most amount of faces would be a fractal kinda octahedron. It counts 1728 faces and funnily enough it belongs to the smallest models I built. Looks like the edges would all be about 0.5 cms long, is that right? Sounds pretty fidgety to me! Looks like the edges would all be about 0.5 cms long, is that right? The edges of the smallest octahedra are 0.6 cm. I am pretty happy with the result. You can feel a "fractal effect" when holding the model. Even though the model is built from normal paper, it feels as if it is made of balsa wood; it even sounds a bit like balsa wood when you turn it in your hand. However the model is not very complex (from whatever view you would like to interpret complex) but on the other hand I like things that are seemingly easy. 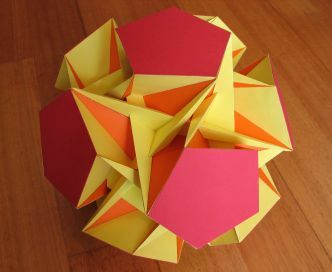 Up to now, the greatest polyhedral challenge to me was W 108, the Great Truncated Icosidodecahedron. Last edited by Ulrich on Mon Mar 03, 2008 12:17 pm, edited 3 times in total. The most complex model I've ever made is the Great Icosidodecahedron. Not much of a match for Miller's Monsters and siris, but I'll get there someday. I seriously impressed with the effort and skill that has gone into these models - personally I am planning on doing everything digitally, and it's likely to stay that way until someone makes a hobby knife with an undo button... Just bought my copy of Stella a couple of hours ago and really looking forward to getting stiuck into it properly at t6he weekend. I'm hoping that this will offer some possibilities that physical models can't match, such as putting the viewpoint actually within a complex shape with holes, and looking out, or making them from glass and so forth. I'm completely clueless about the maths of all this stuff, or the naming, but I do think that the shapes will make for some very beautiful abstract images.